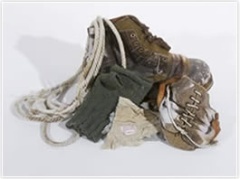 In July 2001, the Mallory artefacts, recovered by the 1999 Mallory and Irvine Research Expedition, arrived at the National Mountaineering Exhibition. By this time our research, into the evolution of mountaineering clothing and equipment, was well advanced. The first sight of these fragments was deeply moving, but we recognised that scientific analysis would bring improved understanding of the performance of the clothing. The fragments were in too poor condition to be displayed, but they held many of the secrets of the 1924 clothing and helped us unravel the Mallory Myths. We felt that we owed it to the memory of the 1920s Everesters to look beyond the fragments and unlock the secrets of the clothing and certainly to see if our early views on 1920’s garments had any substance. Only then could we know how it would have performed and how it compared with the way modern climbers are equipped. Certainly it was different but was it inferior? Was it the best available at the time? Would anyone use equivalent gear today ? These were the questions that led us to the replication project which was a fitting tribute to those who ‘walked off the map’ in the quest for the summit of Mount Everest in the 1920s. It took nearly 3 years of intensive scientific analysis (including scanning electron microscopy and microphotography, spectrometry, X ray spectroscopy) and detective work, to transform the rags brought back from Everest into testable replicas. This work involved teams from the 4 universities of Southampton, Derby, Leeds and Lancaster. The project was not just about a set of textile fragments or even a set of replicated clothes, but about understanding their position in the history of mountaineering and the wider innovation process. This unusual and collaborative project involved historians of innovation, textile conservators and replica makers, working alongside performance clothing specialists, textile and clothing manufacturers and mountaineers. Their layers of wool, silk and cotton were lighter than modern clothing and extremely comfortable to wear. We still do not know whether George Mallory and Sandy Irvine summited on Everest in 1924, but we do know that the clothing they wore did not prevent them. Members of the 1999 expedition concluded these men were stronger, fitter and faster than we are and they were also rather better equipped than popular myth suggests. But having unravelled the clothing myths we are still left with the tantalising question of whether they did summit on June 8th 1924. Their knowledge of acclimatisation and the affect of altitude were still developing, but their long walk in over the Tibetan plateau, at 3658- 4877 metres was an excellent preparation and their practice of climbing high and sleeping low is much in line with Griffith Pugh’s principles. Their upright posture may have helped breathing. I leave it to the reader to decide if this has any bearing on the Mallory mystery. (Mountain Heritage Trust, 2006) £4.95 available through this site.